Trees are locally sourced and selected for their straight grain and even texture. It is best to use wood which has no knots. 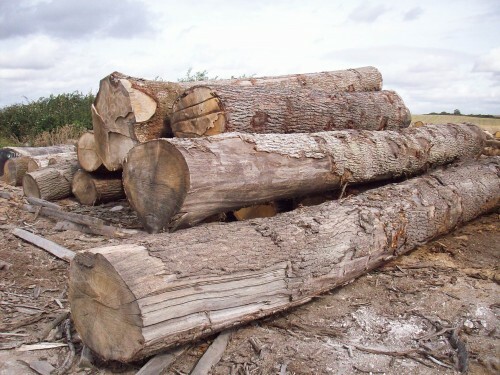 The trees are felled in the winter months, and used whilst "green" (unseasoned) when the wood is much easier to work. While the wood dries it changes shape as it shrinks but this is predictable and allowances are made for this. I cut the pieces to length and then split them along the grain using a froe. 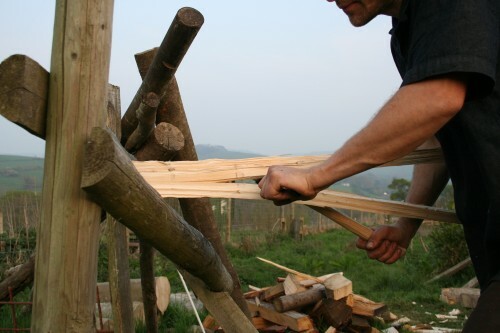 Splitting wood in this way (as opposed to sawing it) maintains the structural integrity of the wood and is quicker. Timber that is cut on a sawbench does not necessarily follow the grain, often cutting across it and creating weak points. 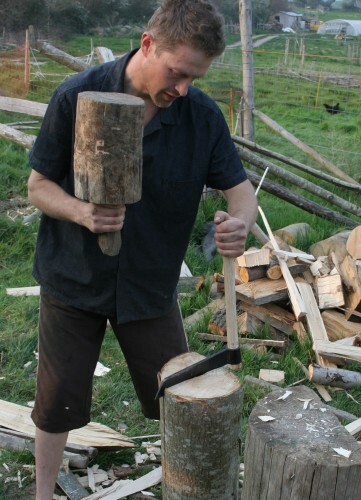 I use a side axe to remove most of the waste wood to about 1/4 inch of the finished surface. 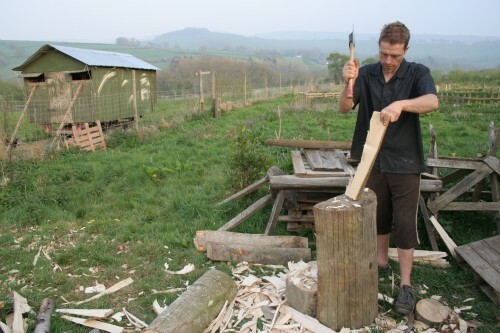 A drawknife is used for further shaping. The work can be clamped with a shaving horse, a home-made device which is excellent at holding work pieces, whether square or round. If the item is not for turning then it is now finished using a spoke shave which leaves a smooth natural finish. 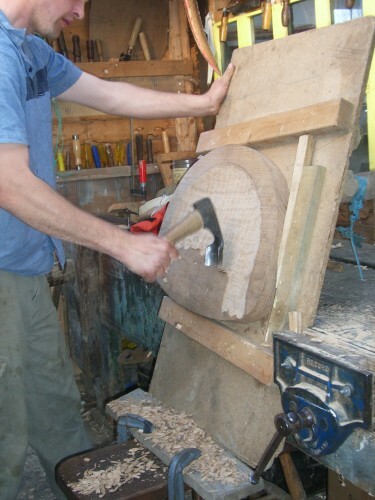 If the item is for turning, such as spindles and legs for a chair, it is mounted on the pole lathe. 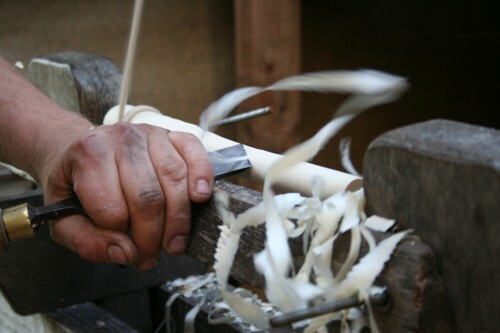 The roughed out cylindrical "billet" is mounted between two spikes with a cord wrapped around it which is connected to a springy pole above and a treadle below. When the treadle is depressed it causes the workpiece to revolve rapidly and allow it to be cut with a chisel. When the treadle is released the springy pole then pulls the cord back to its original position. Tenons must be left oversized to allow for shrinkage. The finish on the legs is smooth and does not require sanding. The pieces are then placed in a box above my wood stove where they are left until dry. The seats are made from wide elm planks 2 inches thick. 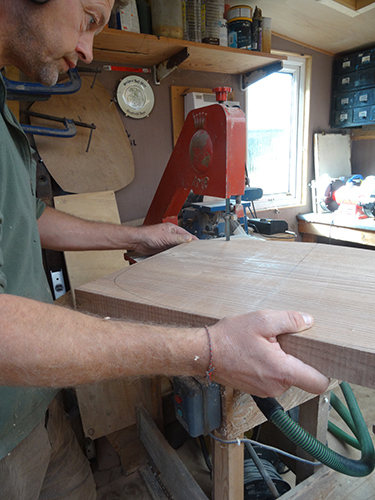 Elm is the best timber for chair seats as it is split resistant. However, elm is increasingly difficult to find and expensive since Dutch elm disease destroyed our British elms and I will occasionally use oak or ash. 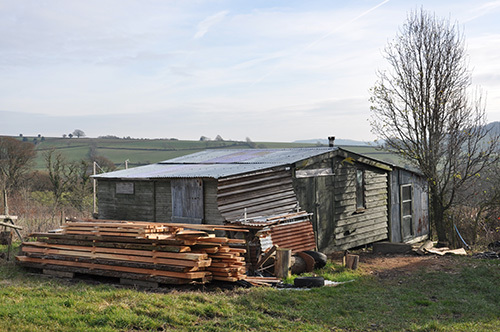 I am a member of a co-operative which owns and operates a portable sawmill, allowing me to saw my own planks. 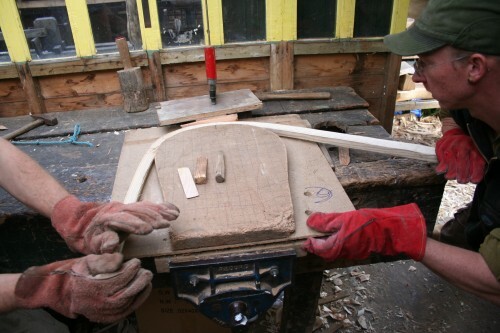 The shape of the seat is drawn onto the plank and then cut out using a bandsaw. The seat edge is then cleaned up with a spoke shave. The top of the seat is hollowed out to be more comfortable. With the seat held vertically I rough it out with a short handled adze. Then an inshave is used to refine the shape and a travisher and cabinet scraper to finish it. 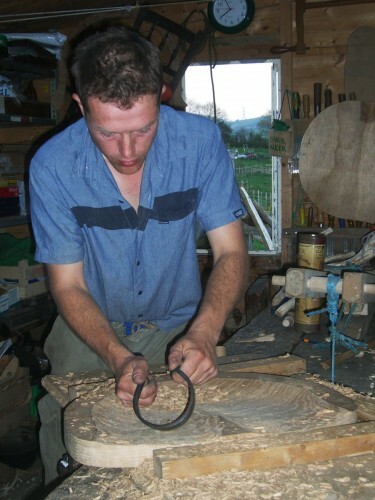 Often in Windsor chair making curved pieces of wood are required. If these were to be sawn from a plank they would not be strong enough. Instead chair makers use a process called steam bending. The wood is prepared paying attention to not cutting across the grain. 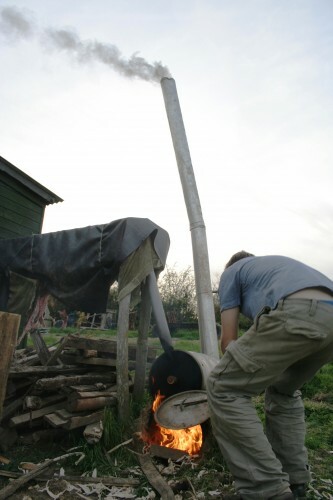 It is then put in a large insulated box which is filled with steam from my home made boiler. It is left for an hour or more before being taken out and bent around a jig while still pliable from the steaming. It is then left to cool and dry. Once all the pieces are thoroughly dried it is time to assemble the chair. 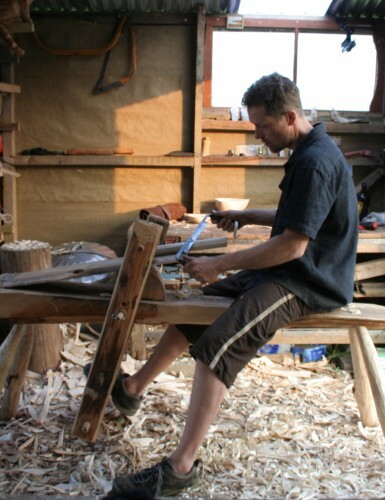 A chair may contain over 40 mortice and tenon joints. It is important that all of these mortices are accurately positioned and at the correct angle. Sometimes I drill these by eye and sometimes I use a system of bevels and mirrors to help judge the angle from different directions. Once assembled the chair is tidied up and given several coats of oil and given a good polish. 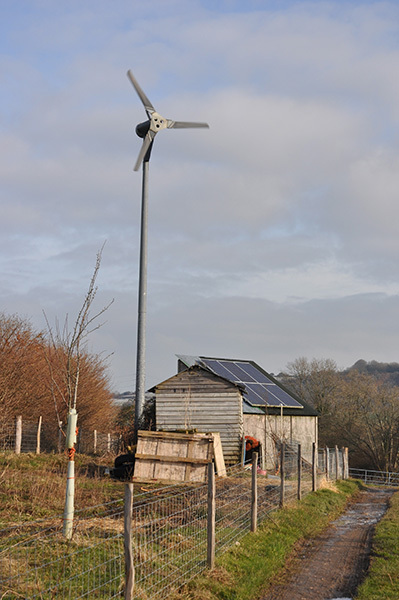 What few power tools I do use are powered by electricity from our wind turbine and solar panels.